Hungry for live music… Look no further! Here’s OffBeat’s look at New Orleans’ top concerts for the week of November 8, 2018 – November 14, 2018 featuring Slightly Stoopid at the Joy Theater; Lillian Axe at House of Blues; James Singleton Quartet at Snug Harbor; Monk’s Dream: Loyola Jazz Faculty perform the music of Thelonious Monk at Nunemaker Auditorium; Christina Aguilera at the Saenger Theatre; Quiana Lynell at Snug Harbor; Billy Strings at d.b.a. ; Beth Patterson at Kerry Irish Pub; Dr. Michael White and the Liberty Jazz Band at Snug Harbor; Cory Henry and the Funk Apostles at One Eyed Jacks; Josh Gouzy at Three Muses; Panorama Brass Band at d.b.a. 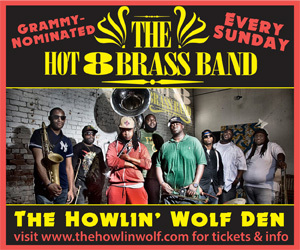 ; Hot 8 Brass Band at Howlin’ Wolf; Sam Price and the True Believers at Maple Leaf; Grayson Brockamp and the New Orleans Wildlife Band at Marigny Brasserie; Rory Rory and the Danger Dangers at Siberia; Skatalites at Tipitina’s; Ernie Vincent Band with Marc Stone at Three Keys; Ani DiFranco and Corey Henry at New Orleans Jazz Market plus lots more!